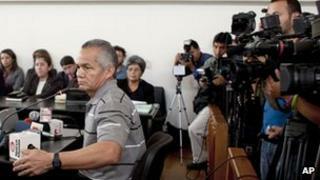 A court in Guatemala has sentenced a former soldier to 6,060 years in prison for his role in the massacre of 201 people during the civil war. Pedro Pimentel Rios, 55, was extradited from the US last year. He is the fifth former soldier to be convicted for the killings in the village of Dos Erres in 1982. The sentence is largely symbolic as the maximum actual term is 50 years but it comes amid renewed moves to try those implicated in civil war atrocities. The massacre at Dos Erres was one of the most violent episodes in Guatemala's brutal 36-year civil conflict. A special unit of the Guatemalan army known as the Kaibiles stormed the village where they suspected residents were supporting or sheltering left-wing guerrillas. Over three days, the soldiers systematically killed hundreds of men, women and children, shooting or bludgeoning them to death and throwing bodies down a well. Pimentel had lived in California for many years before being arrested in 2010, and extradited to Guatemala the following year. He denied any involvement in the massacre. Pimentel was sentenced to 30 years for each death and another 30 years for crimes against humanity. Last year, four other soldiers were also convicted of the Dos Erres massacre and given similar sentences. In January this year, a court ruled that the former military leader, Efrain Rios Montt, should face trial for genocide and crimes against humanity. Gen Rios Montt, 85, was in power from 1982-1983, when some of the country's worst civil war atrocities occurred. Whole villages of indigenous Maya were massacred as part of government efforts to defeat left-wing rebels. An estimated 200,000 people died in the conflict which ended in 1996. Gen Rios Montt denies ordering any massacres.